Here at Pineland you’ll find that not only do we use traditional methods and materials to craft our products we also have a more traditional approach to the buying process. We value every customer and will take the time with your enquiry to ensure your project reaches a satisfactory conclusion. Telephone or email us for a comprehensive brochure / price list. Use the brochure to calculate roughly what your kitchen will cost. Remember in almost every case our final quotation will be less than your estimate as we combine units to effect savings. If you feel our kitchens are within your budget, either visit one of our showrooms or fax/post or email us a simple layout plan showing in imperial or metric measurements the location of windows/doors and ceiling height and initially where you feel you’d like to position appliances. If you have general appliance details, that would help, as would a daytime contact number should we need to query anything. Don’t worry if you don’t have finalised room or appliance dimensions, plans can be modified up to 14 days before delivery. 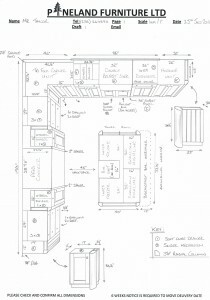 If sending us details we will send you a FREE (no obligation), detailed hand drawn plan by return – fully costed. Please click on the plan below to see an example. Having received your initial plan, please contact us to arrange a visit to our most convenient outlet. A visit to see us is not essential at this stage. Many customers having received their plan / quotation are happy to ring us and reserve a production “slot /week” and visit at a later date to fine tune. Deliver it to you on time – Average lead time is 8 to 12 weeks depending on location / factory loading.